Pokemon Go is huge, but maybe you're having trouble catching the things? Well, Ethan and Alec Sullivan are here to save the day with their How To Guide. We first met Ethan and Alec back in March when they complained about their parents, Sean and Melissa, instituting the James Rabe sit-down-to-pee rule. A rule, by the way, that is guaranteed to bring bathroom smells and cleaning down to a minimum! 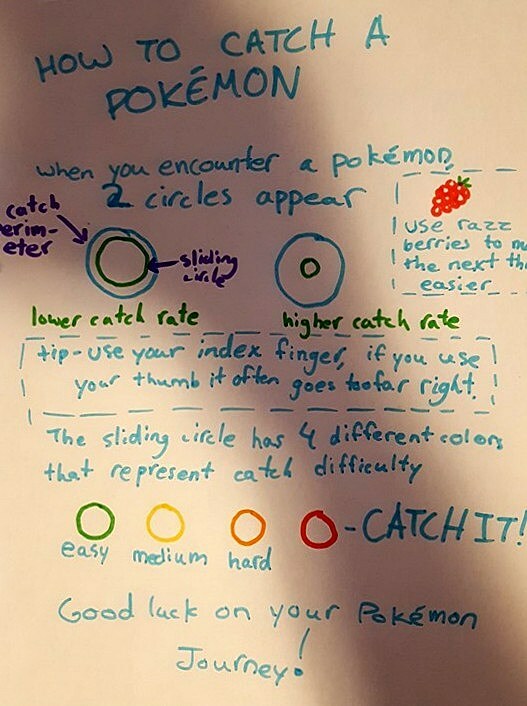 Ethan and Alec wrote down this cheat sheet so their parents can be better players of Pokémon Go! I was with my partner Danielle this weekend and she was really into it. At first it annoyed me, but then I got into it and realized how fun it is! So, thanks, Alec. Thanks, Ethan...you rule. Be careful tho. Know the areas you're going, or at least be aware of 'em, because according to this, some people are being robbed when the game leads them to a secluded spot. I know it seems obvious and it shouldn't have to be said, but you can get wrapped up in game play, and then next thing you know, you've been tricked and you've lost your money, your phone, and who knows what else.